OVER the years there have been many reference books listing locomotive and rolling stock fleets, starting most famously with Ian Allan’s ‘ABC’ guides. Crecy Publishing, which now owns the former Ian Allan books business, has revived the ‘ABC’ brand with this new A5 softback guide to the current British diesel and electric locomotive fleet. 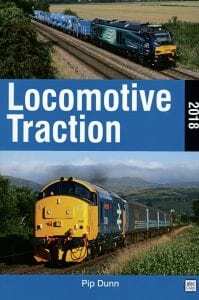 The book is compiled by well-known railway journalist and modern traction authority Pip Dunn, and contains class-by-class lists of locomotive fleets, their status, owner, operator, livery and equipment, plus (where applicable) names, previous numbers and operating pool codes. Technical information for each class is also provided. Both main line-registered and ex-BR machines in industrial/hire use are covered. Also included is a list of the numbers of scrapped BR locomotives (although you’ll need to look elsewhere for disposal dates and other information), current liveries, and an explanation of pool codes. Good-quality colour photographs are distributed throughout the book, although the formatting and layout of the pages leaves something to be desired. Read more Reviews, Letters, Opinion, News and Features in February’s issue of The RM – on sale now!